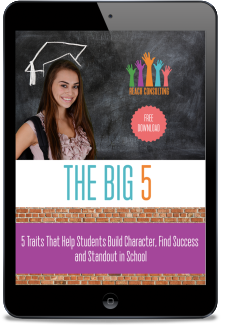 5 Traits That Help Students Build Character, Find Success, and Standout in School. The Big 5 Step #5: Have a responsibility or job outside of school. What if your student could maximize their middle and high school experience by doing 5 simple things in order to stand out in school? There are 5 major concepts I teach students, particularly in middle and high school. It’s the concept of the Big 5™. The first step in the Big 5™ is giving back….